The world, that grey-bearded and wrinkled profligate, decrepit, without being venerable. 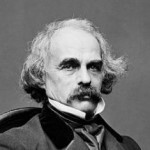 Comments on: "Nathaniel Hawthorne Quotes: The world, that grey-bearded and wrinkled profligate, decrepit, without being venerable." I have come to see the nonsense of trying to describe fine scenery. Dr Johnson’s morality was as English an article as a beefsteak. How is it possible to say an unkind or irreverential word of Rome? The city of all time, and of all the world! The present is burthened too much with the past.